A recent University of Michigan study showed that car ownership was declining in America, but with over 90 percent of households still owning a vehicle, it clearly still plays a major role in most people’s daily lives. Millennials are more likely to be interested in things like ridesharing than older generations, but a large number of them are still buying cars. We analyzed data from our 45 million members and found that 36 percent of Millennials (which we define as people between the ages of 18 and 34) who use Credit Karma have car loans. 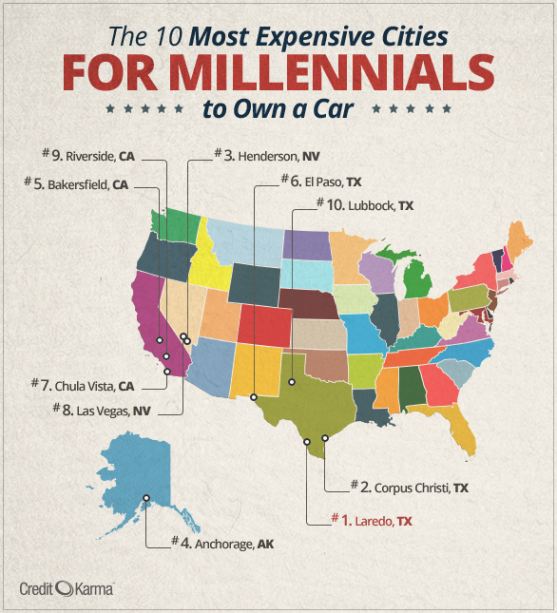 With the plain, old-fashioned car still playing an integral role in Millennials’ mobility and their budgets, Credit Karma analyzed the most expensive places for Millennials to own a car among America’s 100 largest cities. We did this by looking at the average outstanding auto loan balance for Credit Karma members between the ages of 18 and 34 who live in these cities and have car loans and assumed a 5.89 percent interest rate, typical for someone with an average credit score in America, and 67-month repayment term – the average loan term for a new car. We then assumed that each person who owns a car is driving 15,098 miles each year (the average driven by 20-34 year olds in 2014, according to Federal Highway Administration data) and getting 24.1 miles to the gallon (the average fuel economy for new vehicles in 2013, according to the EPA). We then used Gasbuddy.com to find the current average gas price in each of these 100 largest US cities. Texas dominated the list of most expensive cities to own a car, with four cities in the top 10, which were coincidentally the four cities with the highest amount of open auto debt: Laredo, Corpus Christi, El Paso and Lubbock. Three cities from California and two from Nevada made the list, driven by gas prices that ranked as the highest in the nation. Out of the cities that came in as the least expensive, the bottom five were all in the Midwest (Minneapolis, St. Paul, Madison, Detroit, Cleveland). This list is an approximation of cost of vehicle ownership, based on publicly available data from the EPA and U.S. Department of Transportation, used against data pulled from the millions of Credit Karma members between the ages of 18-34 who live in America’s 100 largest cities and have auto loans. It should be used as a guide only. The data assesses the amount of money an 18-34 year old could pay to own and drive a car while living in each of the 100 largest cities in the United States. It looks at the average size of open auto loans for Credit Karma members between the age of 18 and 34, among members who have auto loans, assuming a 5.89% interest rate and 67-month repayment terms. It assumes each person buys gas in the city where they live, is driving 15,098 miles each year (the average annual miles driven by 20-34 year olds in 2014, according to U.S. Department of Transportation Federal Highway Administration data) and owns a vehicle getting 24.1 miles to the gallon (the average fuel economy for new vehicles in America in 2013, according to the EPA).